#POPxoBrides: We Love These Brides’ Sunglass Style! 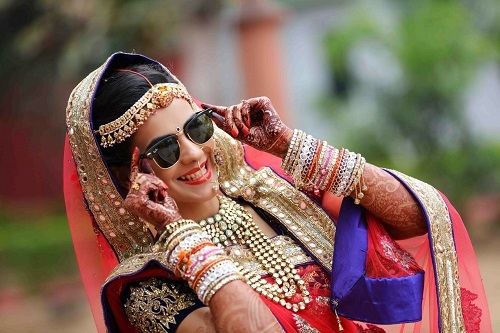 There is absolutely nothing cooler than a bride with her sunnies on! It’s actually the only reason I insisted on a poolside mehendi - so I could flaunt my Ray-Bans with my electric blue suit. Besides looking awesome, pictures with glares are just the coolest! 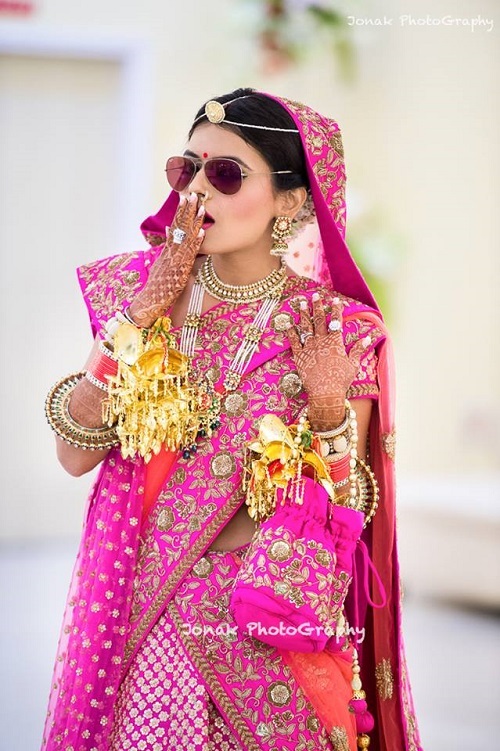 Here are 7 brides who wore sunglasses and nailed the look. 1. Striking it in her sunnies! 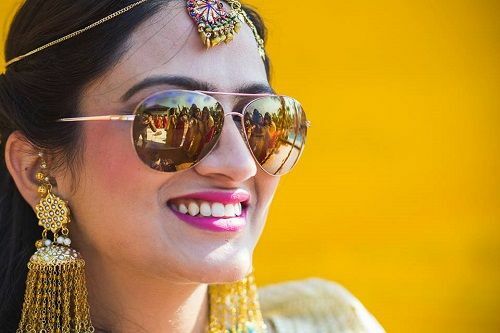 These bright yellow-gold tinted Aviators go so well with the bride's off-white outfit. 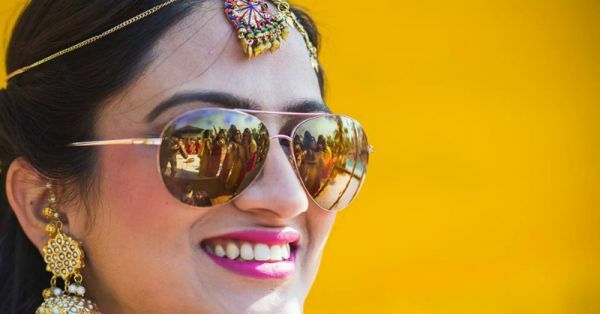 From the yellow genda phool to the yellow turbans and her gold yellow glares, this wedding looks so well planned! 3. Get your funk on! From the quirky colourful outfit to the fun glares, we are loving every bit of this picture. She’s ditched the regular Aviators for a fuller and funner sunnies! I am in love with these! This gold-rimmed pair is just the sexiest I’ve seen in awhile. The floral jewellery and a mint green outfit make the mehendi look perfect. Edgy and fun, go in for the round retro sunnies if ‘usual’ is not your thing. We love these dark-tinted oversized round sunglasses. Brownie points to the bride for carrying it off so well! 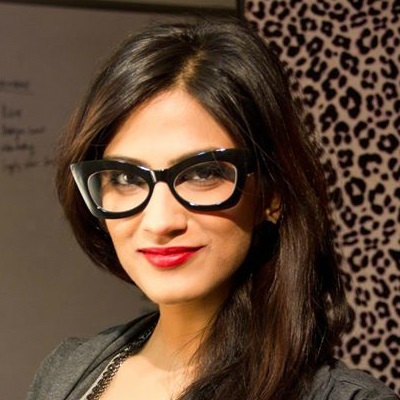 POPxoBride Rucha Vyas took the cool quotient to an all new level with her Ray-Ban Clubmasters! Coupled with her elaborate red and blue lehenga, she totally rocked the look. Image Courtesy: Rucha Vyas Featured Image: Nishant Suri Photography HAVE A STORY IDEA FOR POPxo? If you want to hear about it, we can write about it! Just tell us your idea here! MUST-READ: #POPxoBrides: Floral Jewellery To Make Your Mehendi Look WOW! MUST-READ: These 8 Gorgeous Brides Wore The Most Stunning Jewellery!